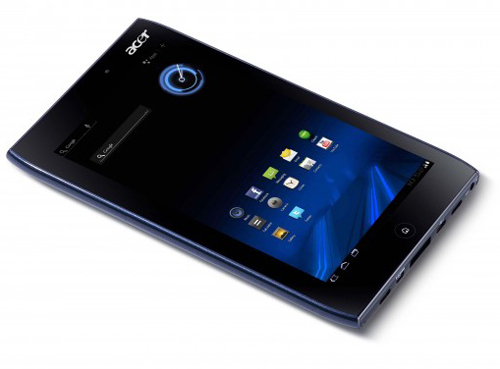 The Acer A100, the industry’s first 7″ Honeycomb tablet, will go on sale today at retail stores across the nation for around $329 (8GB). It’ll run Android 3.2 (since that has been built for smaller tablets), an NVIDIA Tegra 2 processor, dual-cameras, and weighs just 0.92lbs. If you ever needed an inexpensive tablet to travel with, play games on, or stay connected while couch surfing, this might be a great option. We should probably point out that the battery life won’t be stellar though. According to the press release below, it will see up to 5 hours of steady use, which is not impressing anyone. Can’t deny the size and specs – anyone interested? Acer America expands its Acer Iconia™ Tab line of tablets with its first 7-inch tablet – and the industry’s first 7-inch tablet running Android™ 3.2 (Honeycomb) – in the United States and Canada. The new Acer Iconia™ Tab A100 features an incredibly portable sub-one pound design, a vibrant 7-inch multi-touch display, and a sleek, thin design that is comfortable to use and take virtually anywhere. 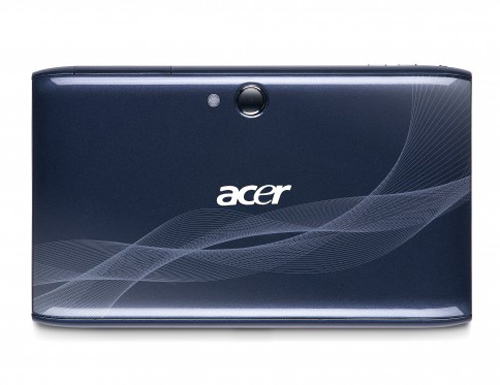 The Acer Iconia™ Tab A100 e-reading functionality will be appreciated by a range of family members. Moms and dads can download e-books to enjoy during quiet moments in comfortable single-handed usage. The tablet comes pre-installed with Google® Books eReading app for enjoying e-books. Plus, the color screen vibrantly displays children’s e-books, so they’ll always have something to enjoy during long or unexpected waits. Extra features like the realistic page turn effect make reading even more fun. The auto-rotation allows customers to enjoy e-books, games, movies and more in either landscape or portrait mode. In addition, everyone can stay up-to-date with extended family and friends via Acer’s Social Jogger, which puts Facebook® and Twitter® in one place for quick and easy reading and updates. Moms can keep their family schedule organized with the easy-to-use Acer “Day Planner” application that gives an easy-to-view list of upcoming activities. Working moms and those with busy schedules will appreciate that the Acer Iconia™ Tab A100 helps them stay productive. Customers can set up multiple email addresses and view Microsoft® Office documents using the trial version of the “Docs to Go” app for getting things done quickly. Customers can enjoy their own digital content on the Acer A100 tablet by transferring files such as videos, movies and eBooks to it through the tablet’s micro-USB port or by using the Micro-SD card reader that can read Micro-SD cards with a capacity up to 32GB.Plus, the integrated Bluetooth allows consumers to connect the tablet to a variety of other devices, such as headsets and keyboards. The Acer Iconia™ Tab A100 is available in the U.S. now at national retail stores and will be available in Canada next month. The Acer Iconia™ Tab A100-07u16u with 16GB of memory(2) has a manufacturer’s suggested retail price of $349.99 U.S and $399.99 CAD, while the Acer Iconia™ Tab A100-07u08u with 8GB of memory(2) has a manufacturer’s suggested retail price of $329.99 U.S. and $349.99 CAD. Since its founding in 1976, Acer has achieved the goal of breaking the barriers between people and technology. Globally, Acer ranks No. 2 for total PCs and notebooks. (3) A profitable and sustainable Channel Business Model is instrumental to the company’s continuing growth, while its multi-brand approach effectively integrates Acer, Gateway, Packard Bell, and eMachines brands in worldwide markets. Acer strives to design environmentally friendly products and establish a green supply chain through collaboration with suppliers. Acer is proud to be a Worldwide Partner of the Olympic Movement, including the Vancouver 2010 Olympic Winter Games and London 2012 Olympic Games. The Acer Group employs 8,000 people worldwide. Revenues for 2010 reached US$19.9 billion. See www.acer-group.com for more information.